Riga under Swedish occupation. Gustaf II Adolf, 1611 to 1632. Silver Dreipolker. Size : 19.2 x 19.4 mm. Weight : 1.11 grams. Obverse : Arms of Sweden, with GVST ADOL D G REX S, with a small lion on a shield breaking the inscription. 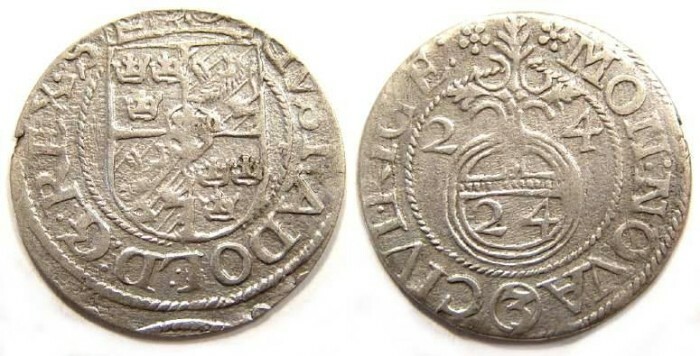 Reverse : Globus Cruseger, with the denomination mark "24" inside (for 1/24 thaler), and the denomination mark "3" below (3 Kreuzers), flaned by the date "24" (for 1624), with MON NOVA CIVI REGI around.